I just love this image, and thought it was about time I put it on my blog. This flower is one of many that grow in a planter on the back yard patio. The flower is that color, but the little tinge of blue or purple on some of the petals comes from the reflected sky on a shiny part of the petals. These flowers always look best in the morning to me. It has to do with them being refreshed from the cool of the night, and the wonderful north light that infuses the patio with a soft glow. And the fact that I am on the patio, in San Diego, drinking coffee, and feeling great! 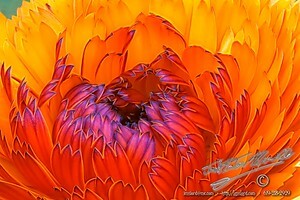 This entry was posted in Flowers, Macro, Purchasable - As Art Prints. Bookmark the permalink.